Elliot McKay See Jr. (July 23, 1927 – February 28, 1966) was an American engineer, naval aviator, test pilot, and NASA astronaut. See started his collegiate career at The University of Texas, but later received an appointment to the United States Merchant Marine Academy, where he graduated with a Bachelor of Science in 1949. Thirteen years later, he received a Master of Science degree from UCLA. He married Marilyn Denahy and they had three children together. Selected in NASA's second group of astronauts in 1962, he was the prime command pilot for what would have been his first space flight, Gemini 9. See was killed with Charles Bassett, his Gemini 9 crewmate, in a NASA trainer jet crash at the St. Louis McDonnell Aircraft plant, where they were to take two weeks of space rendezvous simulator training. Born and raised in Dallas, Texas, See graduated from Highland Park High School in 1945. He was active in the Boy Scouts of America and earned the rank of Eagle Scout. After initially attending The University of Texas where he was a member of Phi Kappa Psi, See received an appointment to the United States Merchant Marine Academy, from which he graduated with a Bachelor of Science degree in 1949. He later obtained a Master of Science degree in engineering from UCLA in 1962. He married Marilyn Denahy on September 30, 1954, and the couple had three children: Sally (b. 1956), Carolyn (b. 1957), and David (b. 1962). "Overwhelmed isn't the right word. I was amazed and certainly pleased. It's a very great honor." After UCLA, See worked briefly for Lykes Brothers Steamship Company. He then applied at General Electric, the company his father worked for, and began work on September 1, 1949 at GE's Aircraft Gas Turbine Division in Boston. When the division moved to Cincinnati, Ohio, See made the move as well. He met his future wife, Mary Denahy, in Cincinnati. See and a roommate purchased a Luscombe Silvaire, which they took on some cross-country trips. In 1952, while taking Marilyn on a trip in his airplane, the engine began to sputter. See attempted to land the aircraft on a short, unimproved field, but the tail wheel snagged a power line and forced the aircraft into the ground. See suffered deep cuts to his face which required plastic surgery. Marilyn escaped the crash with only minor injuries. See later became a flight engineer at the Evendale, Ohio plant. A year later he was called up from the reserves to active service and assigned to Fighter Squadrоn VF-144, based out of San Diego, for 16 months. He spent four weeks in El Centro for training. See was then assigned to USS Boxer, an aircraft carrier in the Mediterranean. His squadron flew the F9F-5 Panther. While on Boxer, he primarily focused on line maintenance, but also became proficient at landing on the carrier. He served as a naval aviator from 1953 to 1956, then rejoined General Electric in 1956 after his tour of duty. He served as a project pilot for the development of the J79-8 engine used in the F4H aircraft. He also conducted powerplant flight tests on the J-47, J-73, J-79, CJ805 and CJ805 aft-fan engines, which involved flying in F-86, XF4D, F-104, F11F-1F, RB-66, F4H, and T-38 aircraft. In 1962, See was selected to be in NASA's second group of astronauts, known as The New Nine. He helped develop guidance and navigation systems. He served as backup pilot for Gemini 5, with Neil Armstrong serving as backup command pilot. 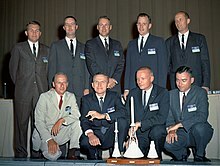 They were the first civilians selected for potential spaceflight. See was a CAPCOM in Houston during the Gemini 7/6A rendezvous mission in December 1965. He was in line for prime crew pilot (second seat) for Gemini 8, but was promoted to command pilot (first seat) of Gemini 9. According to chief astronaut Deke Slayton's autobiography, Slayton did not assign See to Gemini 8 because he did not consider him physically capable of performing an extravehicular activity. Slayton further stated that he assigned See to Gemini 9 because he had become "sentimental" about getting him a flight, calling it "a bum decision." See and fellow astronaut Charles Bassett, the crew for Gemini 9, were killed on February 28, 1966, when their T-38 trainer jet crashed into McDonnell Aircraft Building 101, known as the McDonnell Space Center, located 1,000 feet (300 m) from Lambert Field airport in St. Louis, Missouri. See and Bassett were going to Building 101, where the Gemini spacecraft was built, for two weeks of rendezvous simulator training with their backup crew. They died within 500 feet (150 m) of their spacecraft, and were buried in Arlington National Cemetery. A NASA investigative panel later concluded that pilot error, caused by poor visibility due to bad weather, was the principal cause of the accident. The panel concluded that See was flying too low on his second approach, probably due to poor visibility. Slayton later expressed doubts about See's flying abilities, claiming that he flew too slowly and "wasn't aggressive enough." The mission was launched three months later, in early June, as Gemini 9A. The shuffling of the Gemini crews after the deaths of See and Bassett affected crew selection for some of the early Apollo manned missions. See logged more than 3,900 hours of flying time, including more than 3,300 in jet aircraft. See's name is inscribed on the Fallen Astronaut plaque placed on the Moon by Apollo 15 in 1971. His name is listed on the Space Mirror Memorial at the John F. Kennedy Space Center Visitor Complex, dedicated in 1991. A family-approved account of See's life and career is in the 2003 book Fallen Astronauts by space historians Colin Burgess and Kate Doolan. See was honored as a Distinguished Alumnus of Highland Park High School in 2010. See was a member of the Society of Experimental Test Pilots and an associate fellow of the American Institute of Aeronautics and Astronautics. ^ Burgess, Doolan & Vis 2003, p. 36. ^ Burgess, Doolan & Vis 2003, p. 37. ^ Burgess, Doolan & Vis 2003, p. 44. ^ a b c Burgess, Doolan & Vis 2003, p. 41. ^ "Elliot M. See Jr". The Astronauts Memorial Foundation, The Center for Space Education. Retrieved October 9, 2016. ^ a b Burgess, Doolan & Vis 2003. ^ Burgess, Doolan & Vis 2003, pp. 39–41. ^ a b Burgess, Doolan & Vis 2003, p. 42. ^ a b c d e "Astronaut Bio: Elliot M. See Jr". NASA Johnson Space Center. February 1966. Archived from the original on March 7, 2016. Retrieved October 9, 2016. ^ "Remembering NASA Astronauts Elliot See and Charles Bassett". NASA. February 26, 2016. Retrieved February 1, 2018. ^ "7-Day Space Flight Astronauts Selected". Tampa Bay Times. February 9, 1965. p. 2. Retrieved February 1, 2018 – via Newspapers.com. ^ Slayton & Cassutt 1994, pp. 138, 168. ^ Burgess, Doolan & Vis 2003, p. 110. ^ Slayton & Cassutt 1994, pp. 167, 168. ^ "Charles Arthur Bassett II". Arlington National Cemetery. Retrieved October 9, 2016. ^ McMichael, W. Pate (May 2006). "Losing The Moon". St. Louis Magazine. St. Louis, MO. Retrieved October 9, 2016. ^ "Accident Board Reports Findings in See-Bassett Crash" (PDF). Space News Roundup. NASA. June 10, 1966. p. 3. Archived from the original (PDF) on March 5, 2016. Retrieved June 10, 2012. ^ a b Slayton & Cassutt 1994. ^ Eveleth, Rose (January 7, 2013). "There Is a Sculpture on the Moon Commemorating Fallen Astronauts". Smithsonian. Retrieved October 9, 2016. ^ "The Astronauts Memorial Foundation Space Mirror Memorial". The Astronauts Memorial Foundation. Retrieved October 9, 2016. ^ "Highland Park High School Distinguished Alumni List". Highland Park High School Alumni Association. Archived from the original on September 13, 2012. Retrieved May 7, 2012. Burgess, Colin; Doolan, Kate; Vis, Bert (2003). Fallen Astronauts: Heroes Who Died Reaching for the Moon. Lincoln, Nebraska: University of Nebraska Press. ISBN 978-0-8032-6212-6. LCCN 2003042662. OCLC 51751432. Slayton, Donald K. "Deke"; Cassutt, Michael (1994). Deke! U.S. Manned Space: From Mercury to the Shuttle (1st ed.). New York: Forge (St. Martin's Press). ISBN 0-312-85503-6. LCCN 94-2463. OCLC 29845663. Wikimedia Commons has media related to Elliot See.